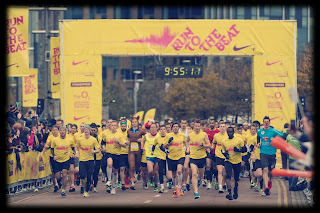 'Run to the Beat' is a mass participation traffic free half marathon in South East London. As the name suggests there is an element of music involved with multiple music stages along the route. I was really looking forward to this one for a number of reasons. It was a big race with 18,500 people registering but what excited me the most was the chance to race in my backyard and run along familiar London streets. Well my current backyard anyway. I could even walk to the start at the Millennium Dome (sorry, the o2 arena) which certainly beats getting a train (or two) and worrying about timings. Another bonus is that the final stage includes my road and part of my route to work. Not to mention Greenwich Park and Blackheath where I do most of my training. The race being in London also meant that I would see some friendly faces along the route - although this made me more nervous than usual as well! My only concern was a few inclines along the way that could effect my chances of cutting a chunk of time off my last half marathon in Maidenhead which was my aim. On a freezing cold Sunday morning, Sarah and I walked to the o2 where there was a throng of activity and thousands of runners and their family and friends. The music had already started and the sight of all the runners in their yellow race t shirt was impressive. 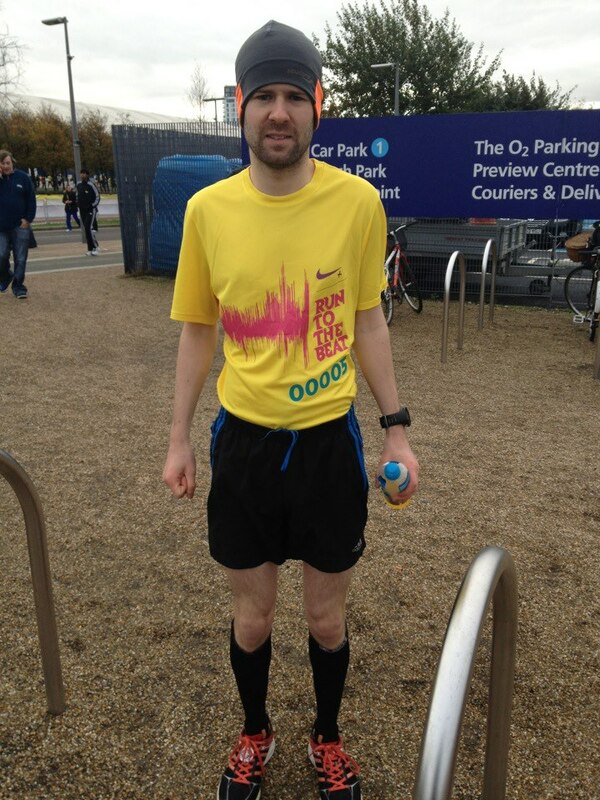 Uniquely, for this event runners race numbers are printed directly onto their official Run to The Beat t- shirt, as modelled below. 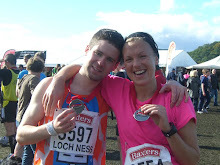 Normally I'd wear my trademark Irn-Bru vest but I thought I'd better get into the spirit of things and didn't want to ruin any of the race photos. Hopefully this hasn't put a potential Irn-bru sponsorship deal in jeopardy. The cold start to the day made preparations very difficult. The build up to the race is always what I dread the most and the cold made this situation must worse. Fortunately I had Sarah to try and keep my feet on the ground and to take my extra layers away before we were ushered to our starting pens. Because my predicted time was under an hour and 20 mins I was in the first pen. Bizarrely my bib number 00005, which I can only assume was down to alphabetical order as opposed to my reputation coming before me. I was determined to avoid going off too fast and put in some consistent splits. I did however still want to hit some fast early miles around the 5:50 a mile mark. The price I paid for my conservative pace was getting overtaken by someone in fancy dress! I did find it quite difficult to settle but managed to clock 5:50; 5:53; 5:52; 5:52. Then came a hill and my outlook for the race suddenly changed dramatically. One of the drawbacks of wearing a Garmin GPS watch is that sometimes you can see your race falling apart on your wrist. But of course you are going to go slower running up a hill and what goes up, must come down. Despite my pace slowing I still seemed to be faring well compared to those around me. I was occasionally overtaking runners who had earlier done the same to me. Maybe this is where running up a hill in all my training sessions in Greenwich Park and Blackheath helped. 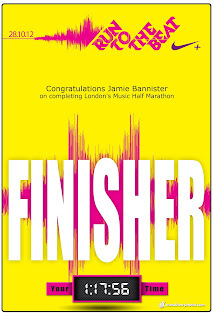 I didn't have anyone overtake me in the later stages of the race which is always a good sign that your pacing is good. There was plenty of downhill sections to come to give me a chance to make up some time. It’s always difficult to appreciate your surroundings when running a long race but some of the sights along the way included the Millennium Dome (o2), the Royal Artillery Barracks, Greenwich Park, the Royal Observatory, The Royal Naval College and not to mention the panoramic views of London's skyline from the top of Greenwich Park. Greenwich Park was a highly impressive sporting venue during the Olympics and Paralympics for the Equestrian and Modern Pentathlon and it was proving to be great for running as well. At around mile 10 we ran down through Greenwich park and into Greenwich village where I was cheered on by a friend from work which gave me a boost. Then at around mile 12 I was delighted to see Sarah and my friends who were just outside my house on Trafalgar Road to show their support. I was glad I wasn't flagging at this point and was able to acknowledge the support. It was a strange feeling running up my road with no traffic and people lined up along the streets - usually I'm running across the road to catch a bus or pouding the pavement dodging prams. Admittedly it was a bit sparse compared to the crowds I've seen there for the Marathon! I can only imagine what that would feel like. My last 3 miles actually turned out to be among my fastest which gives me a lot of hope – it shows that I didn't go out to fast, I was only affected by the hills. With a couple of miles to go I knew I was on for a decent time, although by no means a PB. On the last straight I had my eyes on the clock and could see it nearing the 1 hour 18 mark. A strained sprint ensured it didn't reach this mark before I crossed the line. I picked up my medal and started the refreshingly short journey home. It was a real pleasure to be able to walk home and have lunch with friends instead of starting another journey with tired legs. 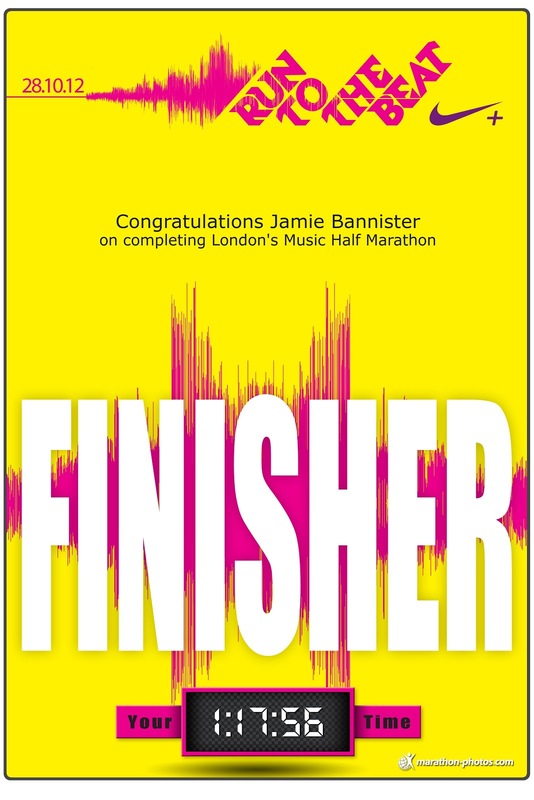 The race confirmed that I am more than capable of achieving a sub 1:17 half marathon very soon but that 1:15 before the end of the year is almost certainly a bridge too far. It’d be interesting to see how many more miles I could have kept that pace up for and makes me wonder how long I should leave it before attempting another marathon. Finally, thanks to everyone who has continued to follow my progress and to those who have had to put up with my running related mood swings!